Stop the Bleeding, Inc: The LIATI Project will premiere its new “Believe” video throughout the Caribbean and in the United States on Thursday, October 20, 2011 at 9 p.m. on Tempo Network’s hit show “Cross Caribbean Countdown.” Tempo, cable television’s most popular outlet for viewing Caribbean music videos and events airs locally on St. Croix cable channel 50 and Channel 52 on St. Thomas and St. John cable television. The video follows last month’s international release of the “Believe” single featuring Virgin Islands artists Pressure Busspipe, Verse Simmonds, Mada Nile, Rena Faith, Elijah Vegas, and Reynaldo “TSR” Canton. All artists, who also appear in the video, donated their time and lyrics to the project. According to Executive Producer Cheryl Francis, President of STB and wife of U.S. Virgin Islands Lt. Governor Gregory Francis, the video is the next step in delivering a message of peace and love to all Virgin Islanders and to people all over the world. The ‘Believe’ single has gotten rave reviews and prominent airplay on local, Caribbean and mainland radio stations, and on numerous internet sites since its debut, said Francis. “We know that our video is going to be just as popular as it builds on our LIATI theme in a big way. LIATI is an acronym for Love Is All There Is and we will always present positive images through music and lyrics to counteract the negative messages our children so often hear and see in today’s media,” she said. 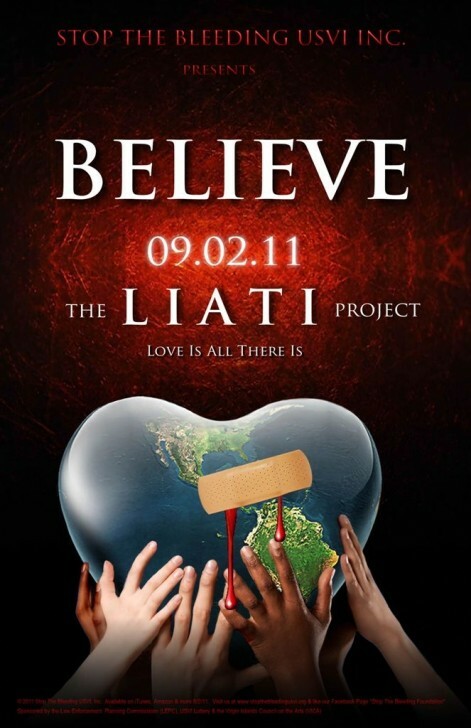 According to Kareem Francis, Coordinator of the LIATI Project, The video has a storyline of victory over adversity. “A young runner, artist, and dishwasher with great aspirations overcome obstacles such as bullying, parental neglect, and minimal skills training in pursuit of their dreams to achieve higher stations in life,” he explained. They triumph in the end because they dare to believe. “We see these problems everyday; we want our young people and others to know that there really is hope if you believe in yourself.” Francis said that the video can also be seen at www.stopthebleedingusvi.org and on YouTube. The full length “Believe” song can be purchased at local record shops and online from Itunes, Amazon.com, Zune, I Heart Radio, Myspace music and Vervelife. It is also available as a ringtone. Musical genius Masai Harris, who has the ability to electronically generate almost any genre of music including R&B, rap, hip hop, soul, reggae, and calypso, spearheaded the studio production of the “Believe” song. Harris began his early musical endeavours as a pianist with the St. Croix Educational Complex High School Band. He has performed with such famous artists as Beres Hammond and Junior Gong, played back up to Pressure Busspipe, Nyorah, and the famous calypsonian Short Shirt from Antigua and played with the Fusion, Rupshun, and Outer Limits Bands. Michael Nissman of St. Croix’s Aqua Media directed and shot the video for Stop the Bleeding. Tempo is the brainchild of St. Croix native Atty. Frederick Morton, Jr. Over six years ago, Morton envisioned an entertainment network dedicated to Caribbean music, culture, cuisine, and social awareness. Its content is developed to rise beyond entertainment to inspirational, progressive and educational programming. TEMPO currently broadcasts in 26 Caribbean islands and on the east coast U.S. to more than three million viewers. Trinidadian artist Patch and St. Croix’s Janeisha John, Miss Universe Virgin Islands 2010, host the “Cross Caribbean Countdown” and will introduce the “Believe” video Thursday on Tempo. Stop the Bleeding Foundation is a non-profit organization dedicated to fostering accountability in the U.S Virgin Islands community regarding the mistreatment, violence, abuse and hurt of children and families through effective communication, inter-agency collaboration, and responsible action. For more information: email theliatiproject@stopthebleedingusvi.org, or call 340-642-3591, and “like” STB on its Facebook page “Stop the Bleeding Foundation.” To make a donation, visit www.stopthebleedingusvi.org. Please contact me to schedule interviews! Thanks for your support!